The Fall issue of Fiber Art Now is heading to mailboxes all over the world and soon to bookstores and independent retailers. It's been a desire/goal/dream of mine to be featured in FAN and now that it's a reality, I am overwhelmed with a range of emotions: excitement, embarassment, nervousness, pride. Putting the magazine in the hands of my 93 year old grandmother was the ultimate joy. If you were a reader this time last year, you may remember that I did not believe she would survive after a spinal injury left her drug addled and unable to use the lower half of her body. Her recovery of body and spirit has been awe inspiring. The essay itself is written by me, as part of the "In Their Own Words" series. It's unnerving to know that my words are out there. At the same time, I feel confirmed that I am on the right path...making good decisions, saying "Yes, I can do that" and "No thank you" at the appropriate times to the correct opportunities. Touched is taking up all of my mental energy, even in dreams. The artwork that has already arrived for the exhibit is gorgeous beyond my expectations and it fuels me to push on. Two week until installation begins! Until then, I will attempt at making my own work again. It's been too long since I allowed myself to play. Hello patient people. A couple of months ago I started journaling in the hazy post-sleep-pre-caffienated minutes of the morning. It's an exercise in focus, not necessarily one to generate any astute writing (it's hardly creative.. terribly terribly boring, actually.) Having this tiny paper & pen ritual where none of my thoughts are broadcast is quite soothing. The surprising benefit is that my handwriting has improved slightly. The surprising disadvantage is that I feel very little desire to blog. So much so, it rarely occurs to me as a "thing to do"! So, without an ironic smirk, I am blogging because I have something to share! And it is this: Touched. My pet project is coming along swimmingly and it's hard for me to talk about anything else these days. In a mere 12 weeks, I hope to be installing this show at Ground Floor Gallery and dearsweetbuddha let me have some hair left on my head when I do. The anxiety I feel about pulling this all off is relatively small compared to the sheer excitement of seeing the works of my peers and colleagues in person. The images and words that are pouring in from the carefully selected artists are stupefyingly gorgeous... they are making me look like a genius for pulling them all together, and for that I am most humbled and grateful. This week Dyeing House Gallery will finally publish the long-awaited interview and they are promoting it as a "mystery", even though I've been talking about it for months now. The pieces I made for this have all received proper titles (Flocculent Succelent, Florapod, Pillowed and Santuario) and will be offered at reduced prices for charity. Being their first artist in this program came with a few hiccups though overall it's been a very worthwhile endeavor. Annalisa Chelli has been a sweetheart to work with! "Sheebie Jeebie" is now on display at Turnip Green Creative Reuse as part of the Nashville Collage Collective show. It's so fun to see it out in the wild! On Friday I'll drive to Memphis for the opening of Art of the South at Hyde Gallery, Memphis College of Art. I haven't been to Memphis as an adult so this will be an adventure. Apparently, the opening will be held during a monthly Trolley Night, where all the art galleries and businesses on South Main will be open and the trolleys run for free. I decided to treat myself with a night's stay at the Peabody Hotel! That's all for now... and keep your eyes on my Facebook page. I'm feeling like a give-away will happen soon! There are three art events I'm participating in this week! The first opens this Thursday in East Nashville. It is a group show at the new Red Arrow Gallery called TAKE HOME ART ((I don't know why they are yelling either... everyone wants to take art home.)) Over 35+ artists from Nashville and Joshua Tree are represented and it is, as the name implies, a cash & carry event. The 2nd show opens Friday in Raleigh, North Carolina at Artspace. That show is titled: Fine Contemporary Craft of the Southeastern US. I'm so honored to have two of my sculptures included... like gushy-happy-oh-my-they-really-like-me-kind-of-honored. And lastly, and probably the one I'm most excited about is my own Open House on Saturday. This will run from 3pm-6pm. Perfect for those on their way to (the insanity that is) Porter Flea and before the First Saturday Art Crawl begins. As you can see in the picture below, I have emptied my vaults (aka living room/dining room) to clear out space for new work. Most prices are reduced 30%-50%.... the older the piece is, the bigger the markdown. And since I'm practicing a very zen-like dis-attachment, prices start at $45 and nothing higher than $375*. Even for me, it's kind of ridiculous. The Dubious Expedition show opens a week from today, and I was fortunate enough to drop off my work in person last week. Maybe it's a good thing that I won't be there for the opening because all the previews/sneak peeks of the pieces coming in for the show are so yummy that I'd want to buy everything! The Courage Unmasked exhibit is now open at Sarratt Gallery on the Vanderbilt campus, through November 21st. Open and free for viewing. With over 50 transformed radiation masks, it is a very sobering and heartfelt show. More pictures!! Here are a few pieces that have come to completion since my last post. Although I haven't been as present in the studio (Tahiti) in the last few weeks, with travel and deadlines to get ready for, it does feel like my knowledge base is growing exponentially. I've been taking Fiona Duthie's online Surface Design workshop, with loads of techniques arriving every Friday. Some of these techniques I've been using since the very beginning (like making spikes and craters) but others have really sparked my imagination (nuno inclusions!). One of my main objectives this year was to push the "Research and Development" of materials and I think that's been a very successful endeavor. You know those little toy cars that you pull back, creating tension and then you let them go and Zzzzoooooooooooooom?! That's kind of what I feel like right now, in an artistic sense. 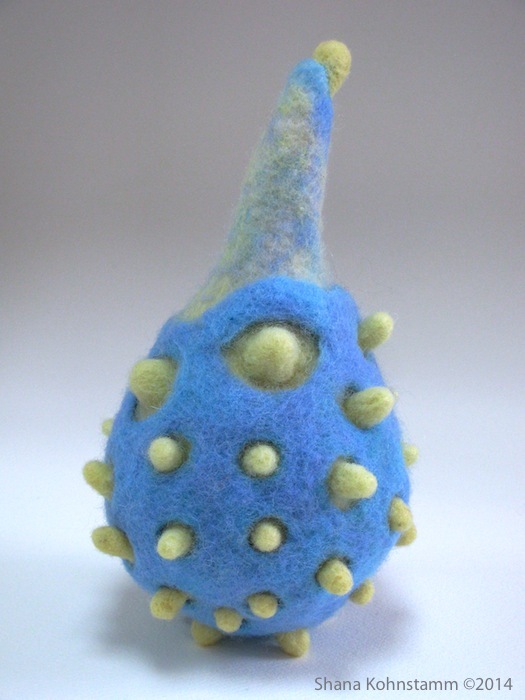 Here's maybe a better analogy: For the last 4 years I have been learning a new language of wool/soft sculpture. I've learned a lot of the vocabulary, discovered the nuances of dialogue, had some incredible instructors, picked up "slang" from the internet, drafted my own lexicon and started babbling. Now I'm ready to really start telling the story of my work. It's exciting and invigorating and slightly terrifying. But first... one more workshop, and this one I've been waiting for for quite a while. I'll be studying with Lisa Klakulak starting this Monday in her home studio in Asheville, NC. As thrilled as I am to be spending quality time with Lisa (who I know from back in her Nashville days), it's the post-workshop days and weeks and months that I'm truly anticipating.. my "Go Zzzzzzzoooooom" time! So, if you're around Asheville for the Southeastern Animal Fiber Festival, drop me a note. I'll be in workshop Monday - Wednesday and then at SAFF on Friday shopping and stocking up for some serious studio time.